This page contains links to free math worksheets for Number Grid Puzzles problems. Click one of the buttons below to see all of the worksheets in each set. You can also use the 'Worksheets' menu on the side of this page to find worksheets on other math topics. Math puzzle worksheets that require students to fill in missing values (Smaller Numbers). Math logic puzzle worksheets that require students to fill in missing values with medium sized numbers. Perfect for grades 3 and up. Math logic puzzle worksheets that require students to fill in missing values. These worksheets have larger values for the operands and the sums than the ones above, and are appropriate for 4th grade students comfortable with larger problems. 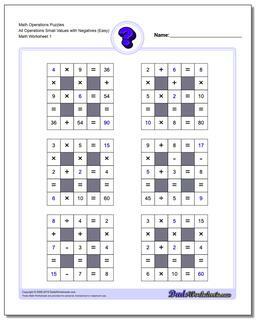 Math logic puzzle worksheets that require students to fill in operations to complete the problems with medium sized addends and sums. Math logic puzzle values that require students to fill in operations to complete the problems with larger addends and sums. Math puzzle worksheets that require students to fill in operations to complete the problems with small values. Math puzzle worksheets that require students to fill in operations to complete the problems with medium sized numbers. Printable logic puzzle worksheets that require students to fill in operations to complete the problems with larger addends and sums. Math puzzle worksheets that require students to fill in missing numbers with medium sized numbers. Math puzzle worksheets that require students to fill in missing numbers with values. These worksheets have larger values for the operands and the products than the ones above. Math puzzle worksheets that require students to fill in operations to complete the problems with medium sized multiplicands and products. 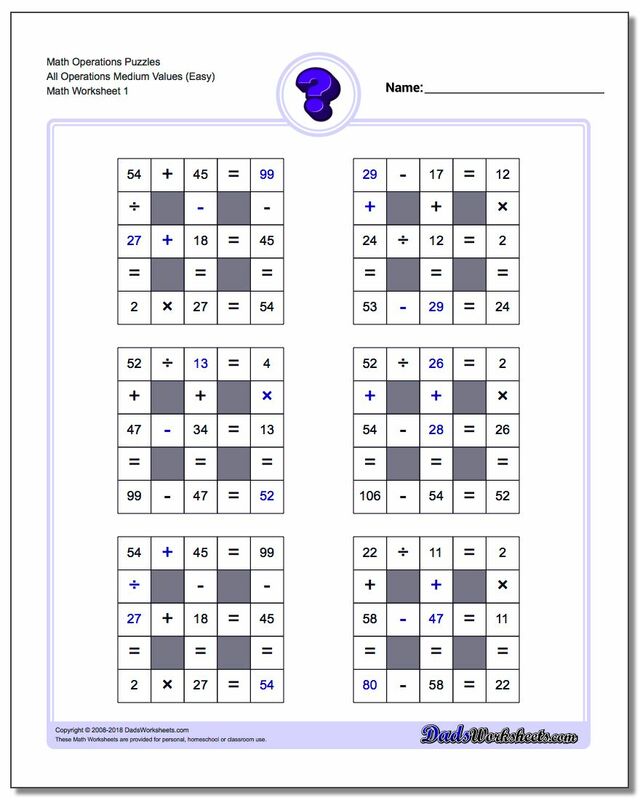 Math puzzle worksheets that require students to fill in operations to complete the problems with larger multiplicands and products. Math puzzle worksheets that require students to fill in missing numbers with values up (smaller numbers). Math puzzle worksheets that require students to fill in missing numbers with medium sized values. Math puzzle worksheets that require students to fill in missing numbers with smaller values. Math puzzle worksheets that require students to fill in operations to complete the problems with values near 10. Math puzzle worksheets that require students to fill in operations to complete the problems with medium sized values.